... were held in modules until the beginning of August when a crop of garlic was cleared to make space for them. ...less than three months after planting out, having seemingly made up for the late start. The yacon (another slow-starting crop) were planted at the same time. …most plants have done no worse than those planted at the conventional time. Maybe the voles drowned this year. I have to conclude that there is probably little benefit in the labour-intensive business of starting plants early under cover. 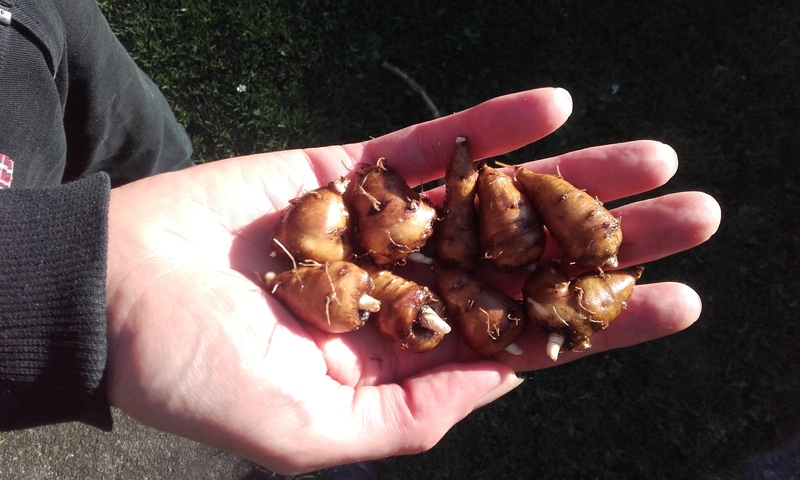 The fact that oca tubers survive prolonged storage, and are resilient enough after sprouting, means that it is not even necessary to hold the tubers in chilled conditions until the chosen planting time. With yield apparently unaffected by early August planting, the crop can comfortably follow or relay with overwintered Alliums, Brassicas or roots, early potatoes, peas, or green manure crops. That's one less thing to do in the April rush. I grew skirret from two sources last year; seed from a commercial supplier, and a few root-cuttings presumably from plants which had already received some selection. Seed-grown plants are highly variable, and give the chance to select for larger root production, so rather than lift the plants piecemeal as required for the kitchen, I'm checking the whole crop to choose and propagate from the best. Apart from being easy to propagate, skirret has a lot else going for it. To my taste, this is one of the best flavoured and textured vegetables I've eaten; sweet and floury, with more character than say potato or parsnip. It's perennial, easy to grow, showing no sign of pest damage, tolerates rough weather, and produces attractive flowers and ample seed. In my experience, it stores well simply left in the ground until needed. With all this, it seems sad that it has almost disappeared from the vegetable garden just because it's a little fiddly to clean compared with potatoes or carrots. There are varied ideas about the best way grow the crop, but I sowed indoors at the end of April, transplanted the strongest seedlings to modules, and planted outdoors promptly to avoid any risk of amusingly shaped roots. I used block planting, spaced at 12" on a bed of silty soil in full sun, and mulched with 4" of raw woodchippings. During mid Summer they got a sprinkling of wood ash, and a little dilute nitrogen feed. During dry spells, they got perhaps 2gal of water per sq.m/week. I can also see potential for my now improved stock in a polyculture system, perhaps with alliums, as the two are active at different ends of the year, but I need to experiment more with basic cultural conditions first before I start getting too creative. Many reports mention skirret roots having a woody core, but I've seen no instances of this in my harvest, and suspect it may be due to cultural conditions, perhaps lack of water. There is a recipe for an impressive Skirret Pie here, and more about growing the crop here at The Backyard Larder Blog, and here at Wetting the Beds. The death of foliage from frost signals the end of the oca season, but at this time of year when tuberisation is in full swing, any slight extension of the growing season will have the maximum effect on crop yield. I stress that again; even one extra week without killing frost could easily have more effect on yield than any other factor over the whole growing period. But it's important to point out that oca can survive light frosts, and there may be some variation among varieties in this ability. Furthermore, it has been speculated that cold weather or slight frost damage may contribute to initiate or accelerate tuber bulking. Most frosts in autumn are radiation frosts, occurring on clear windless nights, often just for an hour or so at dawn. These are capable of being combatted more easily than advection frosts, which are associated with a more fundamental and long lasting atmospheric low temperatures. Topographic placement and aspect. Avoiding frost pockets, and facilitating cold air drainage away from crops is a well understood method. Less commonly understood, is the effect of the upslope area; depending on the soil surface, this can chill or warm the air flowing down over the cropping area. Bare soil, or hard surfaces will produce warmer conditions than continuous ground vegetation or thick mulch. South-facing slopes will receive and store higher levels of the sun's energy than north facing, and so have more to radiate during the night. Mini-scale cold air drainage. Raised beds can protect from slight frosts by allowing cold air to drain away to the lower path areas. Paths should be unobstructed, and run downslope to drain air efficiently, though this may conflict with soil erosion considerations. Beds with high wooden edging are as likely to trap frost as they are to shed it. Growing on supports such as netting, pea sticks, or a tall companion crop may also have some beneficial effect in keeping top growth above the coldest air. Come the first frost, this oca crop should benefit from its bed being raised by a foot or so above the paths, and from its companion crop of sweetcorn, who's dried stems will be left in situ after harvest to trap radiated warmth. The mulch of rotten hay will prevent the soil from keeping the air warm, so should be removed before frosts are due in autumn. Downslope air flow. Any areas or rows of harvested tall crops should be cleared away before frosts if they are located where they may obstruct or slow the cold air flow away from the crop bed in question. Cold Hardening. Exposure to cold conditions is considered by some to increase the crop's frost tolerance, but this effect is apparently nullified by any following period of warm weather, so refrain from adding polythene crop protection if the weather is merely cool. Interestingly, cold hardening of many plant species is associated with the translocation of carbohydrates to the roots, so this may be significant in accelerating tuber bulking. Nutritional Hardening. There is some research showing that plant nutrition may influence frost resistance. Understanding seems poor, but it's probably beneficial to avoid nitrogen feeds in the period coming up to the frost season. Sacrificial companion crops. A taller crop grown with the oca can help to hold warmer air close to the ground. Yacon works well, and can usually produce good crops itself before frost arrives, as it is not day-length sensitive. A slight disadvantage is that once frosted, the companion crop looses some of its protective value due to reduced canopy density. Yacon burned by frost. The Oca underneath is undamaged. Crop debris from previous companion crop. The dead standing remains of tender tall crops (such as corn, tomatoes or quinoa) grown with the oca during the Summer can provide some slight frost protection if they are left in place. Cordon tomatoes growing over oca in late Summer. The dead foliage canopy can provide some frost protection later in the year. ...leaving the rest of the plant unharmed. This is possibly instrumental in boosting the plants' rate of tuberisation. Growing large healthy plants from a full season's growth, or planting at close spacing will result in dense, thick foliage capable of absorbing several frost events before the plant is killed. Physical covers. Polythene, horticultural fleece, newspaper, netting, straw, or sacking can protect against several degrees of frost. For simple management, they need not be removed between frosts, but simply left in place until harvest. Avoid placing them too early, or the plants' cold-hardening adaption may be compromised. Scaffold debris netting protecting a bed of oca. After a night of -4°C the plants are limp but not killed. Other root crops in the photo are (from top left clockwise) celeriac, Hamburg parsley, chuffa, skirret. Casual covering. Crop debris collected from nearby spent crops, such as pea haulms, corn stalks, weeds, etc can simply be thrown over the crop, then left until harvest time. N.B this is not a soil mulch, which would reduce soil radiation; it must be placed over the crop foliage to hold radiated warmth around it. Water spraying. Popular with commercial fruit growers, this relies on latent heat of fusion released during the freezing of water sprayed over the crop. Automated systems are de rigueur for this method, but for really precious crops, some folk may be willing to get up in the middle of a freezing night with the hose! There is an account of using this method on oca crops here. It's strange and counterintuitive, but having the foliage plated in ice really can stop it freezing. Air disturbance. Some commercial fruit growers use giant fans, or even low flying helicopters to mix air layers, and so prevent crops freezing. Rather an expensive method! Added thermal mass. Laying bricks, concrete slabs, containers of water, etc on or near the crop beds will increase thermal capacity. Soil density. Soil with a high ratio of voids (air pockets) will hold less heat than solid soil, and will give up that heat more slowly due to the insulating effect of air, so avoid cultivating the bed, especially as the frost season approaches, to keep the soil dense, and maximise heat storage capacity. Soil colour. Dark colours are more efficient absorbers and emitters of radiated heat. Building up soil humus levels to darken it, or dusting the surface with soot are effective and traditional. Small amounts of charcoal might work, but there is a danger that the effect is counteracted by its insulating properties. Soil surface area. Soil surface with corrugations or 'lumpiness' has a greater surface area, so is able to deliver heat faster than a smooth soil surface. Raised beds or ridged rows also score here, having a greater area than flat beds. Soil surface insulation. Any mulch present will greatly reduce radiated heat from the soil compared to bare soil. Rake back mulches when frost threatens. Peaty soils are also poor heat radiators. Weed Management. Weeds under the crop are undesirable as they reduce radiation from the soil, however weeds taller than the crop are protective, holding warmth under them. Soil wetness. Water has a higher heat storage capacity than the mineral content of soil, so wet soil will have more heat to radiate to the air. If soil is dry in early winter (as if!) extra watering will help protect against frost. Active heating. Some fruit orchards used to be protected by smudge pots, or even heaps of burning tyres, but this has fallen out of fashion/become illegal, to be replaced by large propane or petrol burners. Obviously none of these methods are particularly sustainable, or justifiable in current times. The use of manure-fueled hotbeds may work, but controllability and reliability of effect is poor, and the labour involved huge. If heat has to be added artificially to a crop, in my mind, it's a sign that it's the wrong crop for the location. Surprise! - I was surprised to find this in my garden a couple days ago.